Spain has some well known MTB areas. From the Pyrenees in the North and the Sierra Nevada in the South to the isles of Mallorca and the Canaries, there are excellent places to visit for mountain bikers in this country. The Costa Blanca – in short, the coastal zone between Valencia and Murcia – is less known as an MTB destination. Locally, mountain biking is however very popular which is not surprising because the countryside here offers everything between easy flowing gravel roads to very technical single trails. Cross country, enduro or all mountain style of riding is possible. Because of its mild climate and its hilly landscape it is a perfect area for winter training. In a week´s riding you can improve your fitness and get in shape for the rest of the season. At the same time you can get to know the ´real´ Spain as rides take plays a bit more inland, away from the lively coast. There´s plenty of time for a coffee or sandwich in one of the villages the rides take us through. In this area Snakebite MTB Adventures takes guests all year round on guided MTB tours. Guests we welcomed before were all very positive about our guided rides as is also indicated by our five star rating on TripAdvisor. Get an idea of our rides by taking a look at our YouTube channel or our Google+ page. Finding the nicer bike trails is not always easy and takes time. To allow you to enjoy your ride as much as possible we have built this MTB week around five guided MTB tours. With a minimum of two participants you can already book your guided tours with us. Our guide will pick you up by car either at the villa or the guesthouse (see below) and transports you to the beginning of the trails (and back). We have a selection of rides to choose from, taking into account your personal preferences and fitness. The routes are interesting for both experienced and novice mountain bikers. A certain degree of fitness is required, due to the meters of climbing during the rides. This MTB week can be booked (subject to availability) between the end of September 2016 and April 2017. You can choose to stay in an apartment or a villa. More information about these two options below. 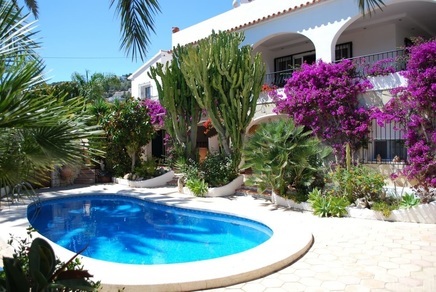 Villa Gecko is a detached villa with a lovely private pool. The villa is nicely furnished and equipped. There is Wi-Fi and satellite TV. The surrounding garden has several seating areas so you can always find a place to linger. A glass of Spanish cava with a piece of tortilla and you will feel right at home! This is the ideal place to just chill out after a good ride. 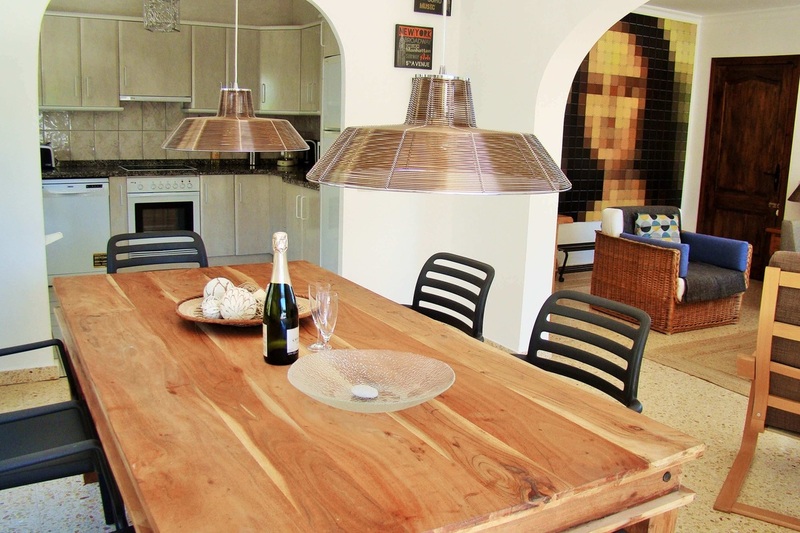 The villa consists of a kitchen, dining area, living room, 3 bedrooms and 2 bathrooms. Everything is on the same floor. 1 bedroom has an ensuite bathroom. Outside is a large table for enjoyable lunches with your group. On site there is room to park two cars. More information about Villa Gecko is available here. 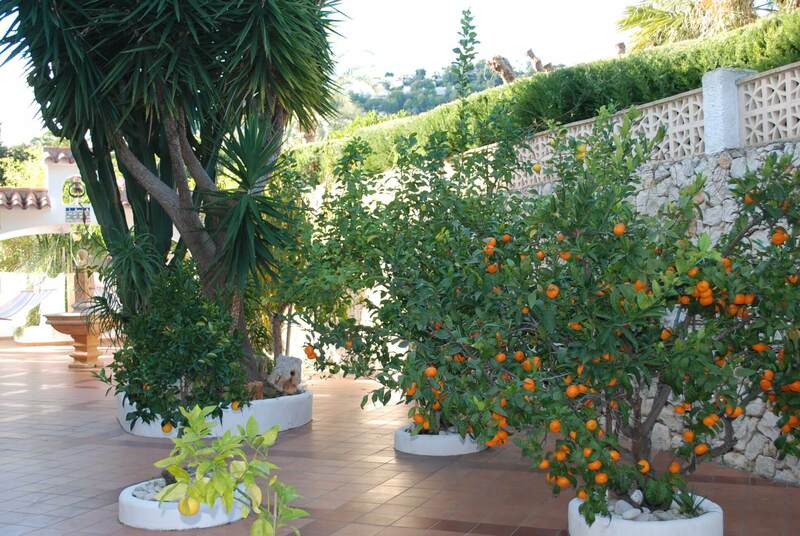 Casa Callas is a guesthouse, situated in the beautiful village of Moraira at the Costa Blanca in Spain. 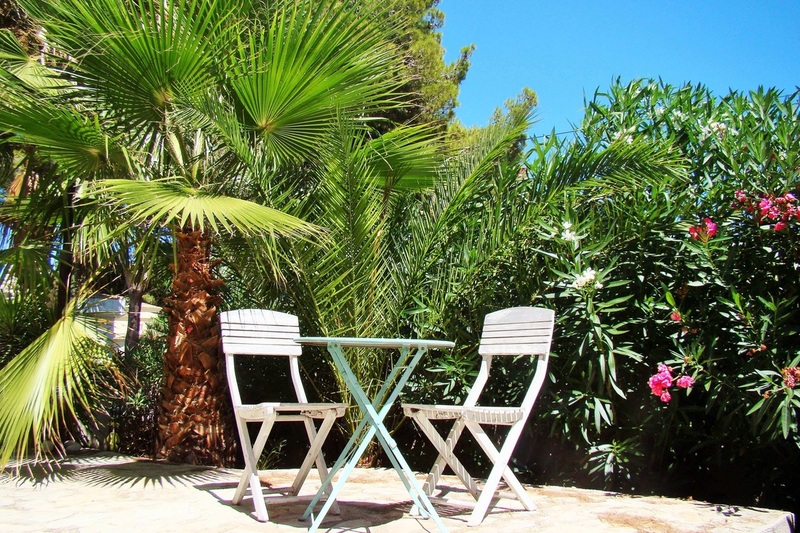 Surrounded by the garden Casa Callas offers rest and relaxation. Moraira and the beach are only a short distance away. The owners, Willem and Martijn, create a unique atmosphere at Casa Callas, best described as a combination of Spanish hospitality and Dutch quality. 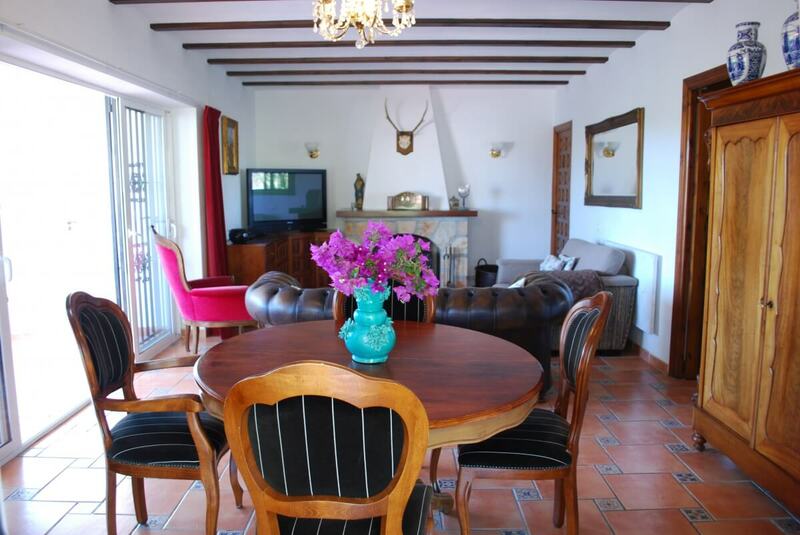 Casa Callas has 4 spacious apartments. All are contemporary decorated with a bathroom with shower, a kitchen with all the necessary equipment and a large living-room. Every apartment has a balcony or terrace with an excellent view of the surroundings and / or the garden with tropical trees and colourful flowers and of course the swimming-pool. Guests who visited Casa Callas reward the guesthouse with 9.6 average. Keywords in their reviews: heartily welcome; rest; attention to detail; clean. Casa Callas is 'self-catering' but shops and many restaurants in Moraira are just 1500 meters away. Consumption of water, gas and electricity (bath) towels, bed linen and cleaning are included. The apartments are suitable for two to four people. Arrival and departure is possible any day of the week. Click here for more information about Casa Callas. Click for more information about this option here. For bookings between 24 December and 7 January and between 25 March and 1 April a € 25,00 surcharge p.p. will apply. Larger group? Contact us for accommodation and prices. This MTB holiday pack includes insurance for damage to the bicycle (with a remaining liability of € 100,00). Insurance for personal accidents and/or damaging third parties is not included in the pack. Always check your travel insurance to see if there is sufficient coverage for risks related to outdoor sports and activities. We also advise to bring your European Health Insurance Card (EHIC). ​The guided bike tours last on average between four and six hours, including stops. The actual duration of the journey depends on the distance (between 45 and 60 km) and the wishes of the participants. You always ride in a small group so as to limit individual differences. The surface ranges from paved roads, gravel / dirt paths through vineyards, challenging rock climbing and the occasional technical single trail. Fun and group dynamics are always paramount to ensure enjoyable rides. ​For these tours we recommend cycling shoes or solid (sports) shoes. Our rental MTBs can be either fitted with ('normal') flat pedals or Shimano SPD (click) pedals. You can bring your own pedals, too of course. Please let us know your preferences in advance. We also recommend that you wear appropriate clothing for the time of year and perhaps carry a rucksack (to carry a raincoat or windbreaker and a snack). You are always required to wear a helmet (available from us). To ask questions about this MTB holiday or make a reservation, please go to our contact page.